Matt Lauer has released an apology, of sorts, for his years of degrading, humiliating, potentially criminal behavior during his time as the anchor of Today. “Repairing the damage,” he writes, “will take a lot of time and soul searching and I’m committed to beginning that effort. It is now my full time job.” His statement is full of the bland PR-tinged nonsense that’s come to define these apologies (“some of what is being said about me is untrue or mischaracterized, but there is enough truth …”), but that line about repairing the damage is the most infuriating sentence. Like most of these apologies and much of the accounting that’s happened in the past several weeks, Lauer’s statement refuses to acknowledge that there is no “repair” for his actions. There is no fixing it. And when I say that, I’m not just referring to the damages he owes to the women he’s harmed — he should do his very best to give them whatever they think is appropriate, to try to redress the harm he did to them, personally. I’m referring to the years and years of his career as an apparently genial, friendly, anodyne TV personality. That, and the harm it’s done to his audience — that, there is no fixing. But that’s impossible. This is not Lost; we cannot go back. So instead, I’m left wanting some pale, wimpy, insufficient accounting. Just as we’ve needed to reconsider the hidden biases in claiming to separate the art from the artist, I want to reexamine the cultural legacies of these apparently unbiased journalistic voices and try to understand the role they held in shaping how we view the world. When we learn that someone like Rose or Lauer has been systematically harming women behind the scenes of their public platforms, I want us to think about the women whose careers have been obliterated, but I also want us to reconsider the history of their public work. Lauer’s entire persona was an inoffensive, personable, noncontroversial father figure — as Brian Stelter wrote in his account of Ann Curry’s departure from the show, “Today has sold itself as a family —‘America’s First Family.’” Aside from that particularly terrible Trump interview (the one that seemed to reveal all his most misogynistic leanings), Lauer’s on-air identity seems best summarized by an Onion headline: “Matt Lauer Waits in Parking Garage for Anonymous Source on Parenting Trends.” He was peak puff piece, the height of warm morning banter and friendly, approachable get-the-kids-ready-for-school TV. But that bland, crinkly-eyed innocuousness was a cover, and an excuse. Clinton’s emails must have actually been a nonpartisan issue, because there was Matt Lauer pushing and pushing her on them as though they were a real scandal. Anne Hathaway must have been at fault for the fact that paparazzi took a photo of her crotch, because there was safe, mild Matt Lauer, implying exactly that. 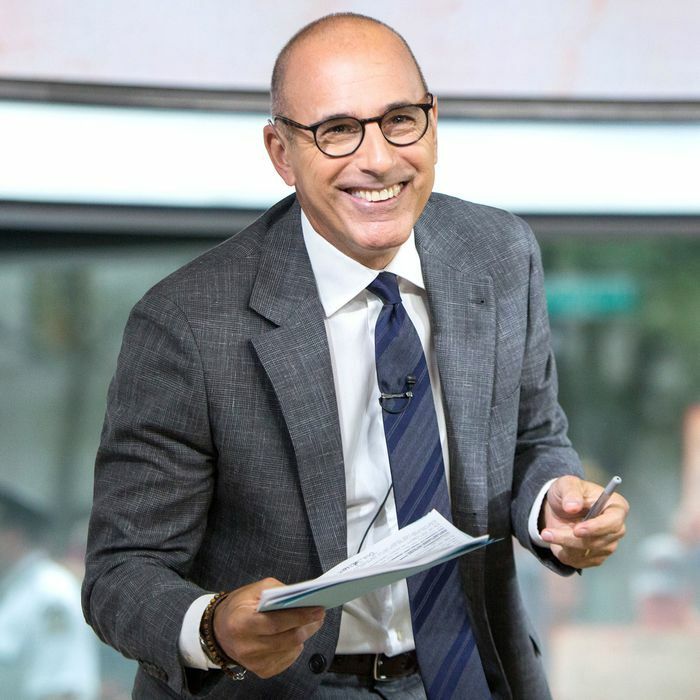 To really repair the damage Matt Lauer has done, we’d need to go back and undo every damaging subliminal message he ever sent in his hundreds of hours on live TV — every slightly too-lusty chuckle, every moment when he complimented a guest on her appearance, every time he negged Ann Curry. We’d need to undo every moment when he hid his misogyny under the cover of being America’s dad and made us believe that it was appropriate for America’s dad to ogle accomplished female athletes on television. To really repair the damage done by Lauer and his ilk, we’d need to reassess the entire idea of America’s dad as an unquestioned purveyor of unbiased truth. We’d need to bring as much consideration to the idea of separating the journalist from the journalism as we have to separating the art from the artist. Ideally we’d need to have done that years ago, and would’ve decided that someone who abused women behind the scenes was not also fit to do a serious interview with the first female presidential candidate with a real shot at winning. But that retroactive undoing is impossible. So for now, what I want is a continued assessment of exactly how much damage Lauer has done. I want us to cast a gimlet eye on the idea that Lauer could be beamed into our homes every morning, and that for some reason it was fine for America’s dad to also be slightly, mildly pervy. I want us to undo the idea of “innocently pervy.” And I’d like for Lauer, and everyone else in a position of having to write one of these apologies, to dispense with the idea that repairing the damage is something they can accomplish.